More than 40 swimmers have braved the icy cold waters of Loch Ken at Crossmichael, near Castle Douglas for the annual Ne'erday swim. Lillie-Mai Jackson who had both legs and her left arm amputated after getting meningitis as a baby, is making waves in her swimming lessons. Three brothers from Cumbria have become the first people to swim across the two biggest and most powerful whirlpools in the world. Thousands of people are visiting the Lake District this weekend, for the annual Big Chill Swim event. Hundreds of people are taking place in a swimming regatta in the Lake District. 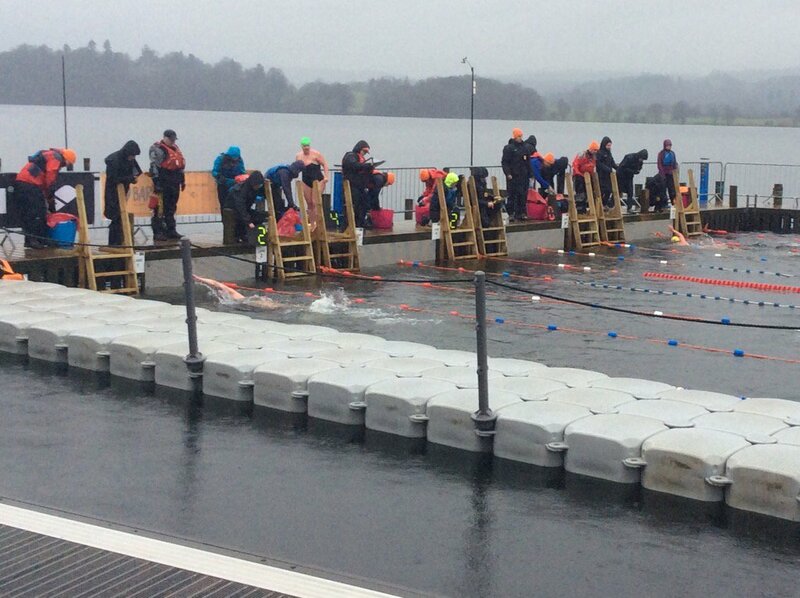 More than 1,000 people are set to brave the cold by swimming in Windermere this weekend. The Big Chillswim Winter Swimming Gala attracts competitive swimmers from countries including Australia, the USA and Russia, and is billed as a major boost for tourism in the Lake District. The success of the Chillswim is having a hugely beneficial effect on local tourism at a time of year when visitor numbers are generally relatively lower." The three day regatta began yesterday, with the World Open Water Swimming Association Awards, but the big event, the Winter Swimming World Cup, takes place over the weekend. It includes the 1km British Winter Swimming Championships. The swimming races began at 9am this morning, and finish at 5pm this afternoon, before a prize giving ceremony. They resume at 9am on Sunday morning. We have seen a dramatic rise in competitors since the event started in 2013, about 250 swimmers back then to over a thousand this year. And it's even more gratifying to see swimmers from all over the UK and Ireland joined by so many international contenders, all of which has helped us secure World Cup status. With the stunning Langdale Pikes as a backdrop, I can't think of a better or more scenic venue for an exciting weekend of highly competitive swimming. We hope that local people will flock to the shores of Lake Windermere to support the event and cheer the swimmers on throughout the weekend." Members of a West Cumbrian running club braved biting winds and icy waters for a New Year's Day dip in the sea at St Bees. The annual New Years Day swim took place at Crossmichael in Dumfries and Galloway this morning. More than 70 brave souls took a leap into the chilly waters of Loch Ken and emerged still smiling. The biggest scheme ever held to try to prevent children from drowning in open water has been launched in Cumbria. The Lake District is one of six locations across the country that's been chosen for the "Swim Safe" initiative. It comes after three people have died in the region's waterways over the last year. Watch Tim Backshall's report. An open day is being held by the Nith Inshore Rescue team. It's taking place at the Caerlaverock Boat House this Saturday 11 July, from 14:00 to 18:00. The 'St John' lifeboat will be on display, along with other rescue equipment, and HM Coastguard, Scottish Fire & Rescue Service from Dumfries Community Fire Station, and St Michael’s Services, will all be attending. At 4pm, the new inland rescue boat 'Cauley' will have its official naming ceremony. The public are welcome, and refreshments will be available.